To be completely honest, my morning routine involves me waking up in a slight panic because I’ve managed to turn off my 3+ alarms, throwing on the unavoidable sweatshirt and leggings, and grabbing a granola bar as I (very quickly) walk to College Hall. In this frantic rush, I rarely ever have time to straighten/curl my hair, so instead, I rely on some foolproof hair tricks that take a couple minutes at most in an attempt to convince people I was not asleep as of 20 minutes before the start of class (yikes). Here are some of my favorite lazy girl hair hacks I hope will help make your mornings a little easier! 1. Side Braid - My hair is in a side braid about every other day, so it is easy to say that it is one of my go-to hair styles when I am running late. If you want to add a little something extra to your side braid, try starting with a small French braid on the side of your part, and then join it with the rest of your hair in a regular side braid. 2. 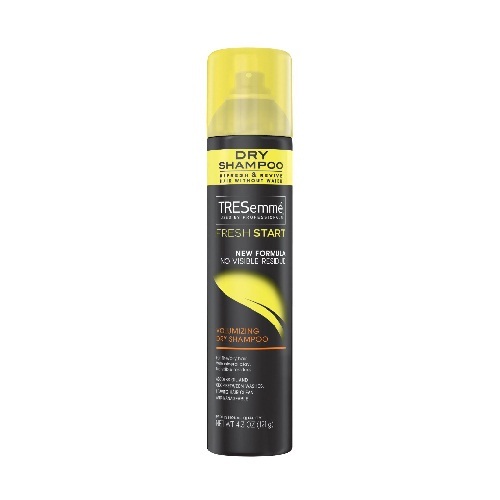 Dry Shampoo - This is a total lifesaver. Just spray the roots of your hair and brush out! Simple as that, and suddenly your hair goes from flat to voluminous in about 30 seconds. 3. Half Up Topknot - The perfect thing about this hairstyle is it looks best a little messy, so don’t worry if your bun doesn’t look pristine! Pull up a section of hair from the top of your head, wind into a bun, and use bobby pins or a hair tie to secure. 4. Overnight Waves - If you are anticipating being rushed for time in the morning, braid your hair the night before and sleep in it. In the morning, undo the braids and ta-da! Easy going beach waves fit for a mermaid. Tip: this works best with damp hair. 5. Messy Bun - Ah yes, the all-else-fails hairstyle, the messy bun. For days when your hair is simply unmanageable, pull it up in a carefree bun (bonus points if you use a cute scrunchie!!). I hope to see you all rocking these easy, yet incredibly stylish, hair styles this week! Plus you can get that extra ten minutes of sleep you desperately need!